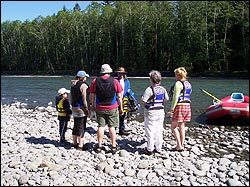 Explore the pristine crystal clear waters of the Quinault and Queets Rivers. Observe the riverside meadows where you may very well see a heard of Roosevelt Elk, a Black Tail Deer or even a Black Bear. Gaze up at the majestic mountains of the Olympic National Park where you just might spot the ever present American Bald Eagle or the vigilant Osprey. Experience the tranquility and beauty of mother nature untouched by human hands. Feel your spirit being renewed as you become one with your surroundings. 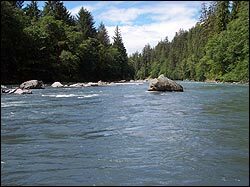 Escape and come let us be your guide on a 2 hour River Rafting experience. 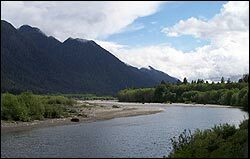 Come share the beauty and uniqueness of the Olympic National Park, Quinault Rain Forest and surrounding areas.. Call and schedule your Escape today... Our shuttle will pick you up where you are staying, transport you to the put-in site and return you from the take-out site to your hotel. 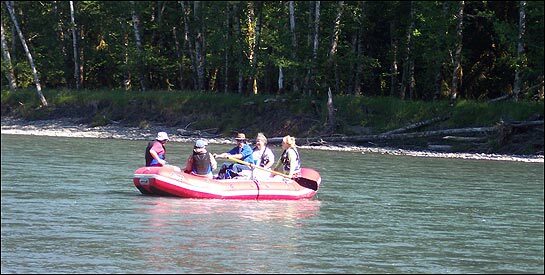 The Rivers that we tour are considered Class-2 Rivers, which are basically calm scenic drifts, with just enough obstacles thrown in to add a little excitement here and there. This is a great family outing and children 6 years and older are welcome. Bring your camera and maybe some snacks and let's have some fun. Trips are approximately 2 hours.